Beaver Creek Outfitters ? A top quality Colorado Outfitter and Guide offering fully guided hunts for mule deer, elk and black bear in Colorado unit?s 4, 12, 214 and 441. They also offer some semi-guided and drop camp hunting as well. Beaver Creek Outfitters is a very flexible and accommodating Colorado outfitter that offers a full range of hunt options. Scott and his hunting guides will tailor a hunt to fit your time frame, abilities and hunt objectives. 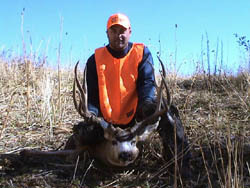 Whether you are elk hunting or deer hunting, they can organize a hunt that will fit your needs. These hunts range from the top notch fully guided hunt where each morning you and your guide will head out together and return to a well prepared meal later that evening to an outfitted drop camp where they supply the camp and you bring all of your food and equipment and hunt on your own. Each of these hunts take place miles from the road and crowds and camp is accessed by a 3 to 6 mile horseback ride which puts the hunter in prime elk and deer hunting territory. Beaver Creek Outfitters operate their hunting camps within the boundaries of deer and elk units 4, 12, 214 and 441. There are also a good number of black bear in these areas that if you have a permit can be hunted incidental to an elk or deer hunt. Scott and his guides have been hunting these areas for many years and have developed a strong knowledge of the elk and their habits. They know where they go when the pressure is on and the best ways to approach them. Some elk hunts in these areas are by drawing only, but others can be purchased over the counter. 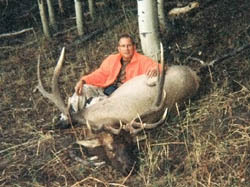 Although their main focus is elk hunting, there are some exceptional mule deer in these areas as well. Deer are typically hunted in combination with elk, but if a hunter wants a stand alone deer hunt, Beaver Creek Outfitters will accommodate that desire and will do everything within their power to make it a success. This is a great outfitter to consider if you want to HUNT NOW while building points for a more difficult to draw area. Check out their website at Beaver Creek Outfitters or contact HuntersTrailhead for more details.